As I described in my closer look at transformation, one of the key enablers of the future enterprise is Structural Change. This slide from a conference presentation I delivered this week speaks to some of the drivers of structural change. A key driver on this list is the ineffectiveness of command and control models in the future business environment. As command and control slowly disappears, new models emerge and questions about effective ways to manage in flatter organizations arise. I recently fielded one such question during the above mentioned presentation on the future enterprise. The response focused on culture, the corporate value system, collaboration, communication, openness, transparency and trust. One great example of a flat company that exhibits many of these characteristics is not surprisingly an Internet company – Google. Google’s approach is outlined in a recent Article from the Harvard Business Review . Additional thoughts on moving towards an open and transparent culture can be found in this IBM CEO Study from 2012. Examples of companies that are starting to create these new models are emerging – and I firmly believe that it’s only a matter of time before structures suited for the digital age take hold. There are still many skeptics out there – and no one has this all figured out. 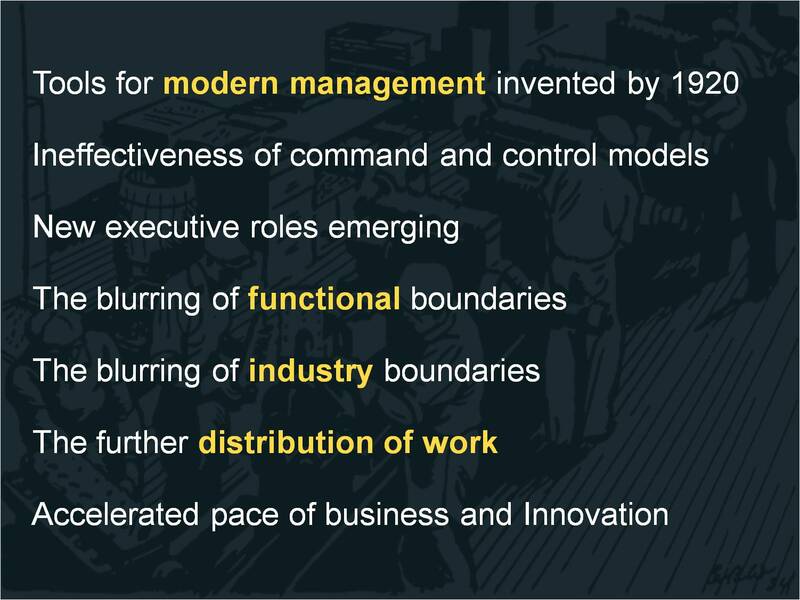 Leaders of the Industrial revolution era created the management structures that enabled business in that era. It’s time for leaders in this very different era to re-imagine these structures for the present day environment.